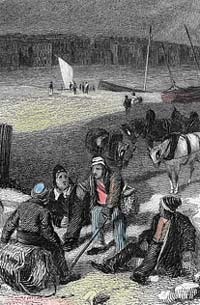 Ask anyone to describe an 18th-century smuggler, and they will probably tell you about a Cornishman called Tom dressed in long boots and a striped jersey. He rolls a couple of kegs up a moonlit beach, hides them in a cave, then hawks the brandy round the village. Everybody knows him as Tom the Smuggler, and his neighbours take it in turns to distract the revenue man at the front door while Tom rolls his barrels out the back. How accurate is this traditional picture of the smuggler? On the one hand it is a romantic impression that doesn't accurately reflect the historical facts about smuggling at any one place or time. However, it might be argued that the substance (though not the letter) of this popular image represents correctly the extraordinary circumstances which supported a vast expansion of illegal imports in the 18th and early 19th centuries. 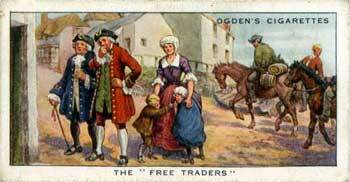 In the 18th century illegal trade across England's coast grew at a prodigious rate. What had previously been simple small-scale evasion of duty turned into an industry of astonishing proportions, syphoning money abroad, and channelling huge volumes of contraband into the southern counties of England. Even by modern standards, the quantities of imported goods are extraordinary. It was not unheard of for a smuggling trip to bring in 3,000 gallons of spirits; to picture this in your mind's eye, imagine some 1,500 cases of brandy stacked in your garage. Illegally imported gin was sometimes so plentiful that the inhabitants of some Kentish villages were said to use it for cleaning their windows. And according to some contemporary estimates, 4/5 of all tea drunk in England had not paid duty. Statistics like this are even more extraordinary when seen in the light of the time. The first steam-powered ships appeared only in the early years of the 19th century, so sailing ships brought the goods from the continent, and kegs and bales were man-handled — often up sheer cliffs — to a waiting file of men. These carriers then transported the goods either in carts or caravans of ponies, or lashed the tubs to their own backs for a journey inland. Whole communities connived in the trade, and profited from it. The Scilly Isles, for example, was totally reliant on smuggling for its survival, and the islanders were brought to the point of starvation when prevention measures were stepped up in the area. A large cargo drained capital from the area where it landed: in Shetland and around Falmouth there were times when every available penny had been spent on contraband. And there are numerous instances of whole communities uniting and taking up arms to reclaim cargoes that had been seized by the revenue. This extraordinary situation was not the result of some plan or a plot hatched in a smugglers' tunnel. Rather, it was a natural and inevitable result of punitive taxation imposed by a succession of governments each more desperate than the last to pay for costly wars in Europe. 18th century taxation fell into two categories, each administered and collected by a separate government department. Customs duties had a historical precedent in that the English Crown had for centuries claimed a proportion of all cargoes entering the country — or a financial levy in lieu of the fine wine or bolts of fabric. In 1688, though, the customs duties were streamlined and restructured into a form that would — in theory at least — generate more revenue for the exchequer. The other type of duty had its origins in the Civil War: a tax on land took the place of two older taxes — wardship and the parliamentary subsidy — and a new tax, excise, was levied specially to pay for the war. Excise was a tax on domestic consumption, and during the years of the civil war it covered many different items, but its scope was reduced ten years later to cover just chocolate, coffee, tea, beer, cider and spirits. However, after 1688 it was progressively widened to include other essentials such as salt, leather, and soap. The separation of these two taxes mattered not a jot to the common man, who knew only that he had to pay more for what he bought. And as the 18th century progressed, the slice taken by the exchequer increased sometimes steadily and progressively, sometimes by leaps and bounds, as the conflicts with France ebbed and flowed. By the middle of the century, the tax on tea was nearly 70% of its initial cost, and the double burden of customs and excise duties was widely resented by a rural population often close to starvation. Collection of the customs duties was haphazard and bureaucratic and was largely based on a system, established in the 13th century, of custom houses at ports around the coast. In the ensuing centuries a creaking and corrupt hierarchy had grown up around the custom houses. The collectors and comptrollers of customs and their multitude of functionaries were primarily concerned with taxation on the export of the wool that made England wealthy. However, when the dawn of the 18th century heralded heavy taxation on imports, the system was ill-fitted to combat the spirited efforts of large numbers of Englishmen determined to defraud the King. We'll return to look in more detail at the historical background to smuggling. But to understand how smugglers operated, it's enough to know that they were opportunists, taking advantage of a demand for heavily-taxed luxury goods and the state's almost total inability to collect those taxes.